Wiand Guerra King P.A. 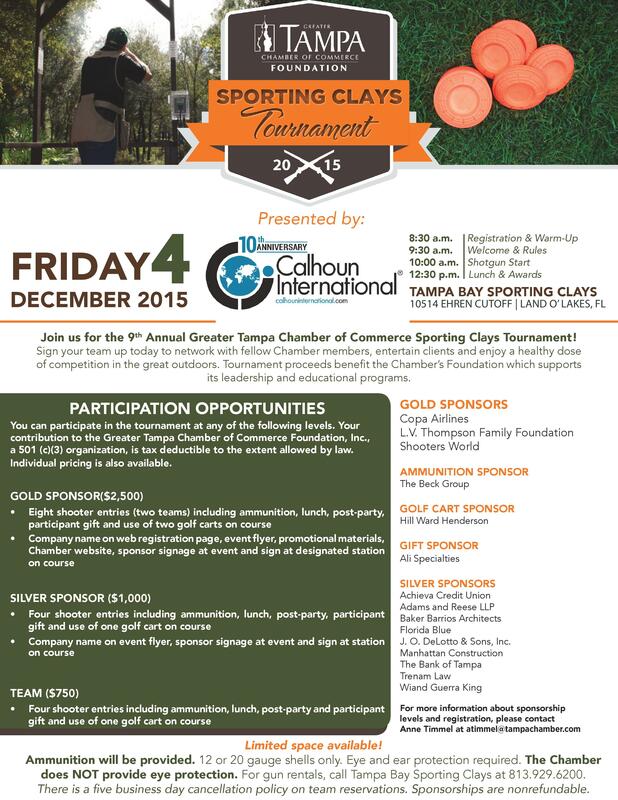 is proud to be a sponsor of the Greater Tampa Chamber of Commerce’s 9th annual Sporting Clays Tournament to be held on December 4, 2015, at Tampa Bay Sporting Clays in Land O’Lakes, Florida. The tournament will feature teams of four competing across ten different shooting stations followed by lunch, awards, and raffle prizes. The prizes include four tickets to a Tampa Bay Lightning game in Wiand Guerra King’s luxury suite at Amalie Arena, multiple hotel stays, gift cards and baskets of all kinds, and even airline tickets to Panama. There is still time to sign up a team of four, and anyone interested should contact Jared Perez at jperez@wiandlaw.com or 813-347-5114. Proceeds from the tournament and raffle (tax deductible to participants) will benefit the Chamber’s foundation, which supports its leadership and educational programs.